Mmmm, I know how you feel about the skillet but now after having them let me convince you: just get at least one. Store it anywhere. Under your bed, in your closet, use it as a coffee table. Just purchase one. You'll love it. And, yes, what you mention above is the Spanish tortilla. (Nothing to do with mexican style) They are very much like a frittata indeed. They're incredible. Especially when you start by slicing the potatoes very thin and slow-cooking them in olive oil to cook them before adding the eggs, meat and onions. I'll do a post on them one day too. They are divine. I went to the store tonight to buy some eggs, and that song was playing in my head! I love making fritattas (or tortillas as I call them since I lived in Spain for a few months). Baked eggs are the perfect blank slate for whatever your heart desires. P.S. Thanks for reminding me that I need to replace my old non-stick skillets. Subito. 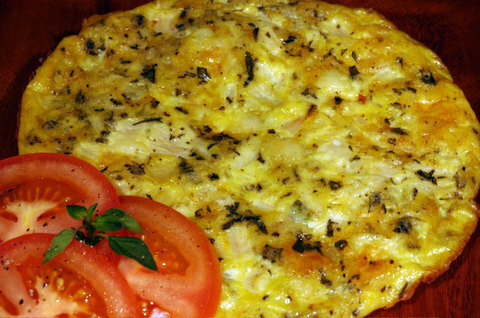 Ahh----Frittata....the best recipe for eggs and especially with asparagus. Nice Egg.I like to have egg items daily.I like your dish very much. Glad you like the frittata, contaminated soil. Interesting name you've got there!